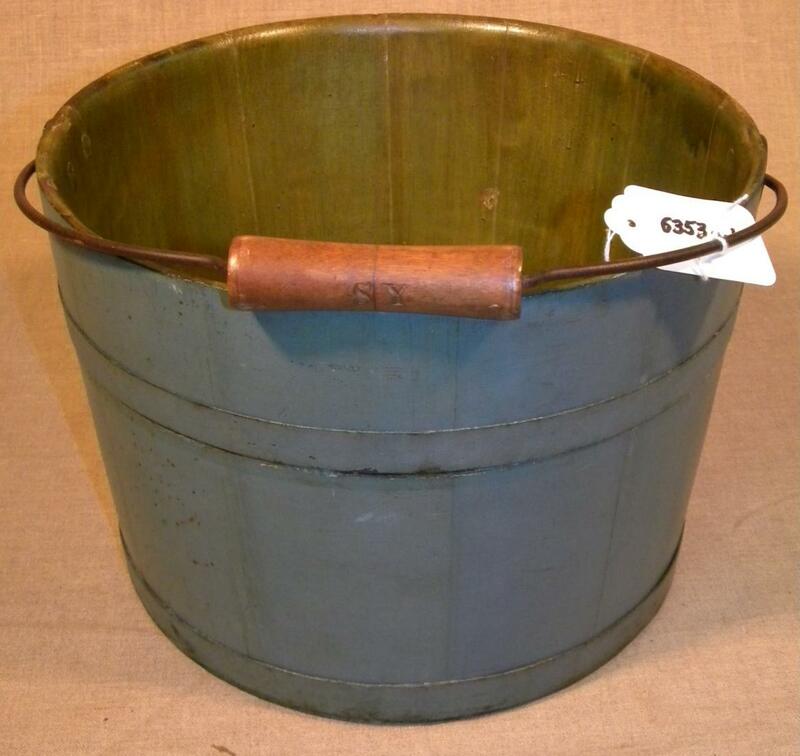 Coopered pail (a) with pine staves and bottom, two iron or steel hoops, teardrop-shaped bail brackets of iron, wire bail, and a turned birch handle. 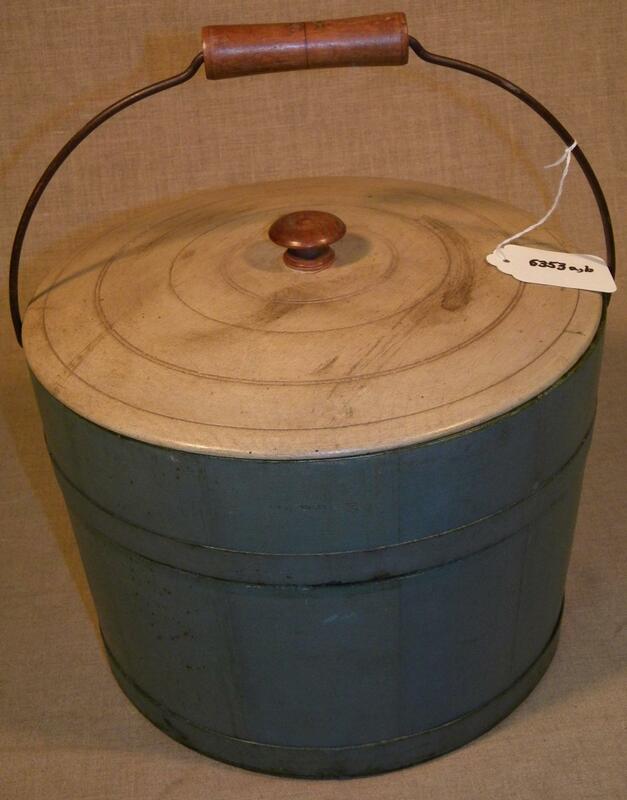 Turned pine cover or lid (b) with turned cherry knob through-tenoned into the cover. Exterior painted blue, including the underside of the bottom. Interior stained green over white. Cover painted white. Lid knob and bail handle both natural (unpainted). 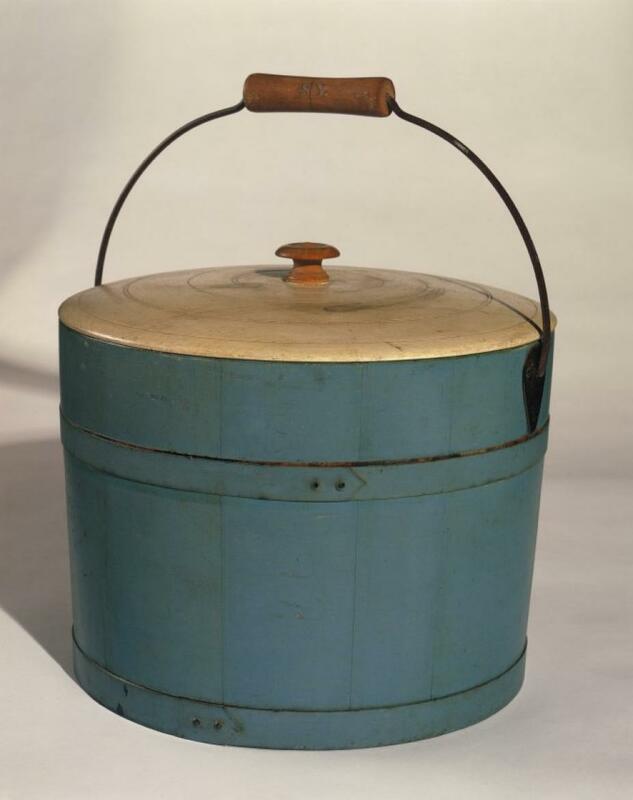 Fine pails, nicely painted (in this case, blue outside and green inside), and fitted with covers, were intended for indoor use. 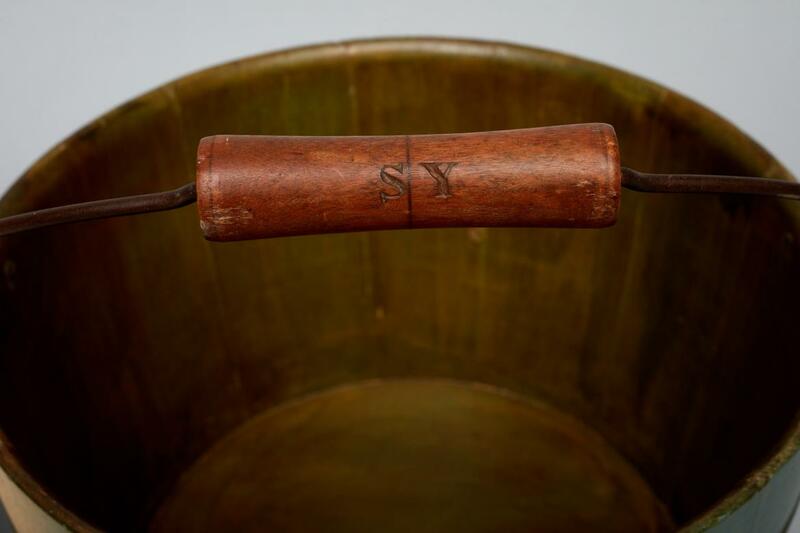 This pail, with the letters "SY" incised in the handle, was used in the Church Family's infirmary. Items belonging to a specific building, in this case the infirmary, were identified by the Canterbury Shakers with specific letter codes. A number following the building code would have referred to a room within the building. 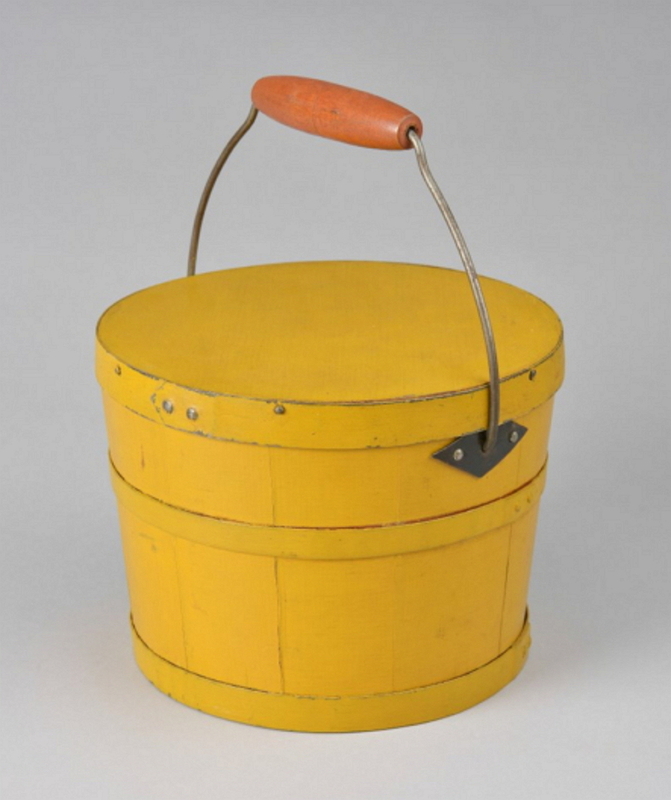 This pail is machine-made, that is, the edges of the staves were planed by a machine that cut a v-shaped, tongue-and-groove joint that kept them precisely fitted together. After the staves were set up to form the pail, they were placed on a special lathe that smoothed and rounded both the inside and outside of the pail. The iron hoops, bail plates, and bail were secured after the pail was turned. Machinery for making pails in this manner was introduced at Canterbury in the 1830s. The cover and knob were turned on a lathe by hand. 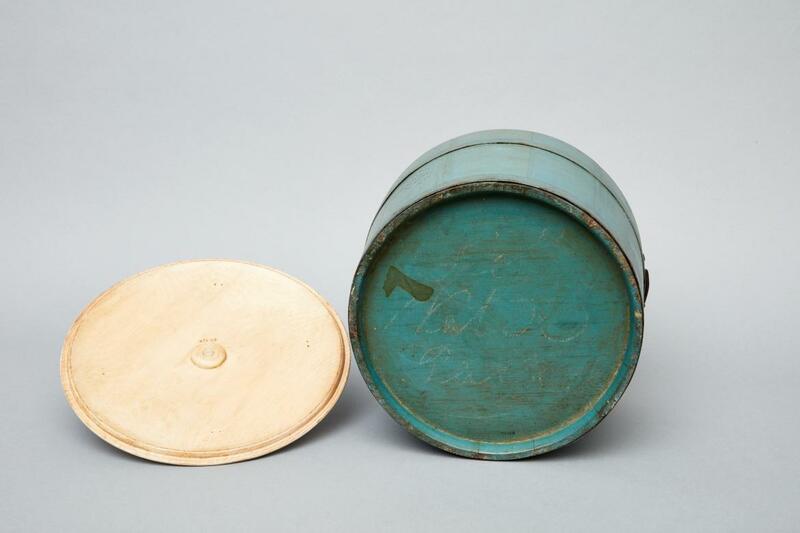 June Sprigg speculates that this pail was made by Levi Stevens (1781-1867) because he was identified by Henry C. Blinn, Canterbury elder, as having been a maker of pails and a wood turner. 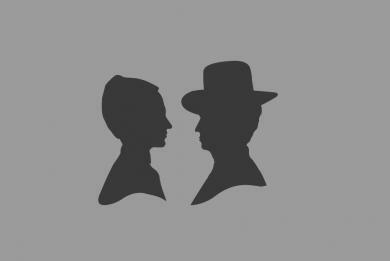 References: Henry C. Blinn, "Church Record [1784-1789]," Shaker Village, Canterbury, NH. 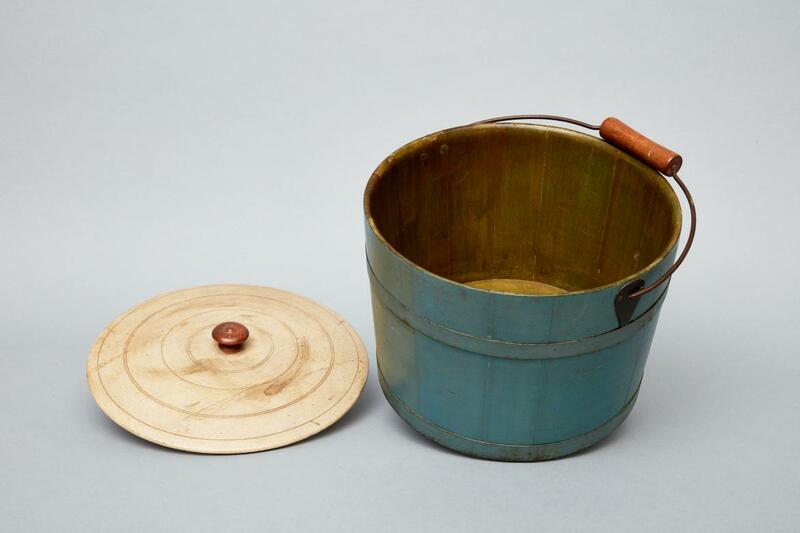 June Sprigg and Jim Johnson, Shaker Woodenware: A Field Guide. Volume I (Great Barrington, MA: Berkshire House, 1991), p. 107. 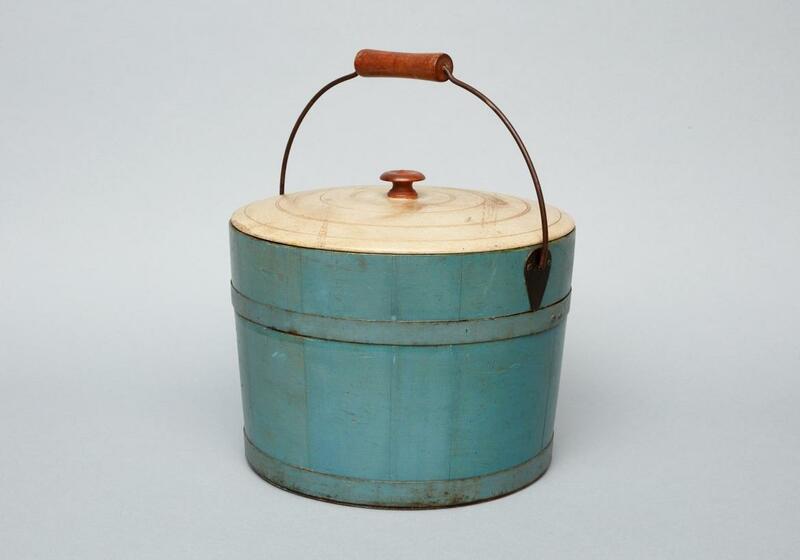 June Sprigg, Shaker Design (New York: Whitney Museum of American Art, 1986), p. 112.